I'm doing another garbage brew as I've done 1 before, and it turned into the best beer my friends and I have ever had. Unfortunately, I didn't write anything down that time. This time will be different. I could use some insight as to what hops & yeast I should use. Keep in mind I'm not a fan of IPA's. 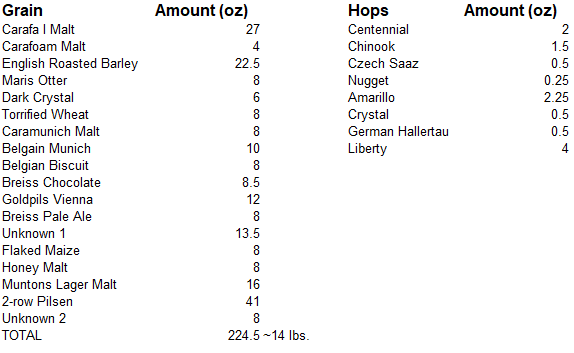 Here is the leftover grains and hops I have in my inventory. My goal is to use a most if not all of the grain. I look forward to ya'll's advice. That looks like alot f Chrystal malt. Looks to be about 8 lbs base malt so I would use more than a pound of Chrystal. Through in the flaked wheat. all the nugget and another .25 Chinook at 60 .5 centennial at 15 and .5 amerillo at flameout. Would. Make a nice mildly hoppy pale ale. Those numbers are all in ounces, meaning I only have just under half a pound of Crystal malt. What type of yeast would you use?